As the Boy Scouts say: Be prepared! Magic remains Earth’s oldest existing system of crisis management. No magic is as consistently effective as the magic born of necessity. No spell works as well as an emergency spell. Thousands of years of human experimentation in the face of desperation has produced a repertoire of heavy-hitting, take-no-prisoners spells. Even if you have never practiced magic, even if nothing you have ever tried has ever worked, it’s more than likely that an emergency spell will work for you, especially if you’re genuinely in the midst of a crisis. The magic of desperation is unfortunately an excellent opportunity to truly taste and flex your own personal power. In fact, the ultimate goal of an experienced psychic worker is to possess the ability to summon up the clarity of focus, desire and vision that real emergency inspires without actually suffering the emergency. Collect money that you’re owed, with a separate category for collecting child support. Make an unwanted lover get lost. Oops!! Get him or her back. Make your mother-in-law love you. Make your boss be kind to you. Banish houseguests who’ve stayed too long. Obtain your heart’s desire and more. Spells derive from a multitude of metaphysical traditions ranging from ancient Egypt to modern New Orleans, from China to Arabia and many others. Magic When You Need It also contains a formulary of some of the most popular, traditional hoodoo oils, the stuff that old-style psychic workers used to mix up behind closed doors, keeping their prized, powerful ingredients secret. Now you can easily blend your own magic oils. Also included is a shopper’s appendix detailing reputable vendors of genuine occult goods and spiritual supplies. 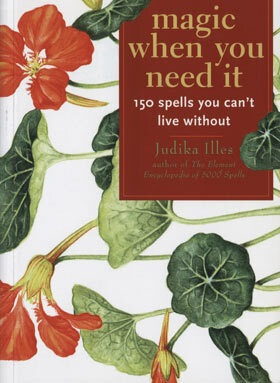 Magic When You Need It is an updated, improved version of the now out-of-print Emergency Magic!